Every once in a while, you come across an album that clings to you. It has everything you want in an album, and the band masters all of these elements. Every once in a while, you find an album that you will listen to for many year to come. 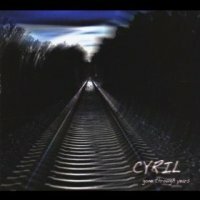 Cyril's debut album, “Gone Through Years” is just such an album for me. This debut album is thematically based on H.G. Wells' story “The Time Machine”. Wells is my favorite author, so I was already onboard for that idea. On a side note, this album is “thematically” based on the story, so don't expect a chronological presentation of events, but more of a study of the emotions that the traveler experiences. Cyril comes from the ruins of a pop rock band of all things. Gabria was its name, and I'm glad they dissolved. Cyril represents music of a much more ambitious and sophisticated nature. The music is melodic prog rock in the vein of Pink Floyd and maybe Big Big Train, too. However, they have more of a melancholy atmosphere, so neo-prog seems to be an influence here as well. The guitar work is great with some powerful lines, and the drumming is wonderfully appropriate and diverse. However, this band is not afraid to include other instruments, such as the clarinet, sax, and mandolin. This eclecticism adds so much to the album, from awesome sax solos to constant melody. I also must note the great male and female vocals: They are perfect for this theme. “Gone Through Years” immediately wowed me. The music is grand, but the atmospheres and emotive moments are things you won't find in most music. I was highly impressed with the exploration of time travel's effects on the traveler, and his heartbreak for his sweet Alice. Imagine, for a moment, that you experience the death of all your friends, all you know, and the love of your life. Imagine, for a second, that you witness the end of the world, and discover the grand futility and frivolity of our world. Those emotions and more are packed into this work of art. My favorite tracks include “Through Space and Time”, “Gone Through Years”, “Mentalscars”, and “Gate of Reflection”. These tracks represent a musical journey that invites you to become one with it: to get lost in the ambiance and sentiment. Cyril has crafted an immense album here: One that has captured my imagination and my musical tastes. I cannot recommend this album enough, and I still can't believe this is a debut album! The music is tasteful and mature, and the lyrical content is inspiring and imaginative: You don't find that hand-in-hand very often.